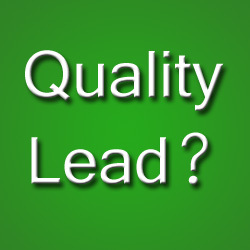 Sharon Drew Morgen » What is a quality lead – and does it matter? Everyone defines ‘quality lead’ differently. Some use ‘lead scoring’ to follow different ‘touch points’ – determined by industry standard or corporate dictate – defined as having a ‘buying’ value that is supposed to project a close. Some use the telesales function to ‘qualify’ and pass on to sales what has been somehow deemed ‘promising’. Is a ‘quality lead’ expected to lead to a closed sale? A meeting? A ‘hot’ opportunity regardless of outcome? Who defines the criteria? Do you really know what ‘stage in the buying process’ leads are in? Really? “Part of the problem is often that marketing and sales view the idea of “leads” differently. Quality is in the eye of the beholder. Marketing is searching for and cultivating leads who are likely to become your customers at some point – meaning that they could actually need what you sell to fix a high-priority business problem. Marketers need to have a big-picture view to ensure they can fuel a continuous pipeline. lose opportunities to use our compelling technology to actually influence the buying decision journey at the ACTUAL point where decisions get made. buyers won’t buy. They will not seek content, use content, or act on it. Or they will pass our brilliant content over to other vendors. Or use it in a blog post as their own idea. Following content use will merely tell us who is looking and how they are looking. The rest is a guess. Buyers seek content only once the Buying Decision Team is ready, willing, and able to manage internal issues of politics, management, company/family strategy. As a result, the very last thing prospects need (some say 70% into the buying decision process, but I say 90%) is content. We are spinning our wheels following digital footprints and assigning lead scores, rather than using technology to guide the front end – the human side of the buying decision process. When a marketing/sales enablement technology ‘manages the buying process’ they ignore the need to create new technology to manage the human side. We can help chart the course through the miasma of decisions necessary. But not using current methods. And until we do, we cannot have quality leads. To me, a quality lead is one in which the Buying Decision Team is formed or being formed, has considered or accomplished their buy-in activities, and may be ready to choose solution. Our technology should be able to help them accomplish these activities. Need? Interest? We’ve been focusing on those criteria for decades and all it’s gotten us is 7% closing rate. And now we are assigning value to specific activities where no real meaning (and only guesswork) exists or we’d be closing a helluva lot more. We can use technology to lead; we are wasting a huge opportunity. Beginning with the assumption that a prospect has not managed all of their internal buy-in issues (or they would have resolved their problem already), we can use technology as a guiding light – a GPS system – and enter the buying process much earlier by facilitating the confusing internal issues that are non-content/sales related. Instead of us assigning specious meaning to potentially random content-driven activity, we can actually help buyers first manage their buy-in issues. Then, the lead will have qualified itself and be ready to buy you. Without all of the guesswork. Which is it? Do you want to sell? Or help someone buy? It’s two different activities. With technology it’s easy to do them sequentially and get a truly qualified lead. And you can close a helluva lot more than you’re closing. With highly qualified leads. Dear Sharon, I really enjoyed reading points, which you have raised in the article. Thank you.